Automating Data Validation Lists in Excel » Accounting Advisors, Inc. Working in an Excel spreadsheet can be somewhat like the Wild West – unless other provisions are made, users can enter any value in any cell. One way you can restrict users to a predefined set of values is by way of Excel's Data Validation feature. I'll explain how you can create in-cell drop-down lists, along with how to “future proof” the Data Validation list so that the feature won't require maintenance if you add additional items in the future. 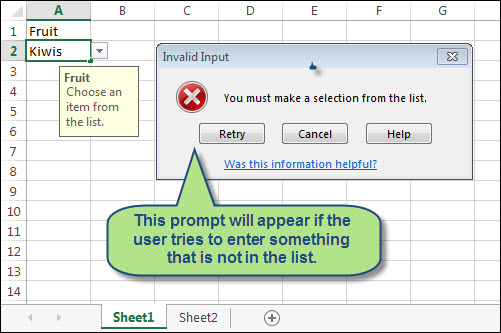 This technique also resolves an annoying problem in Excel 2007 where data validation lists cannot be placed on other worksheets. 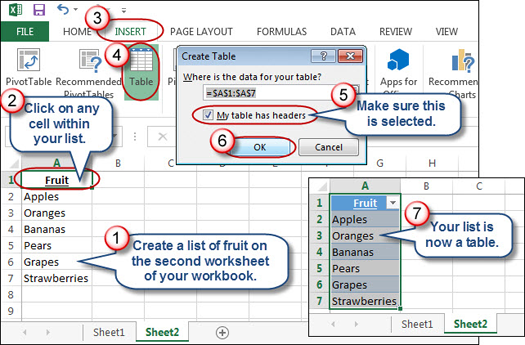 Excel 2007 and later – Choose Insert and then Table. Make sure that My Table Has Headers is selected and then click OK.
Excel:Mac 2011 – On the Tables tab of the ribbon, click the arrow next to the New command and then choose Insert Table with Headers. Excel 2003 and earlier – Choose Data, List, and then Create List. Figure 1: Enter a few items on the second worksheet of a workbook. Excel 2007 and later – On the Formulas tab choose Define Name. Excel 2003 and earlier, or Excel – Mac 2011: Choose Insert, Name, and then Define. Once the Define Name dialog box shown in Figure 2 appears, enter a name such as Fruit, ensure that the Refers to field references the second through last row of your table, and then click OK. Figure 2: Assign a name to the second through last cell of your table or list. Let's first take a look at the Data Validation feature. 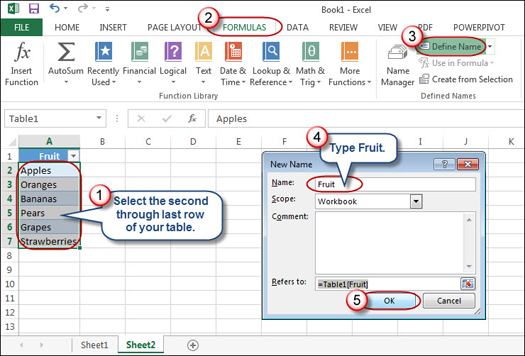 On the first worksheet of the workbook where you created your list, click on cell A1 and type the word Fruit. Next, select cell A2 and choose Data and then Data Validation. The dialog box in Figure 3 will appear. On the Settings tab, choose List in the Allow field. When the Source field appears, type an equal sign along with the range name that you assigned before, such as =Fruit. Figure 3: Choose List and then specify your range name as the Source on the Settings Tab. On the Input Message tab, enter a title, such as the word Fruit, to describe the input field, along with a message, such as “Choose an item from the list,” as shown in Figure 4. It's not necessary to use quotation marks in the Description field. 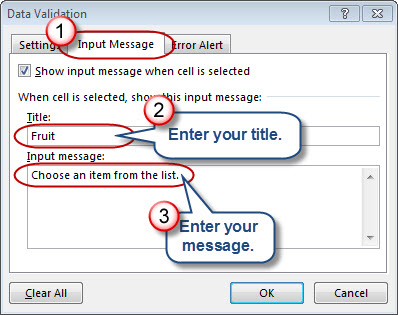 Figure 4: Although optional, the Input Message tab allows you to document the validation. Finally, on the Error Alert tab, enter a Title, such as “Invalid Input,” and an Error Message, such as “You must make a selection from the list,” as shown in Figure 5. Keep the style set as Stop to prevent the user from bypassing the list items. Click OK to close the Data Validation dialog box. 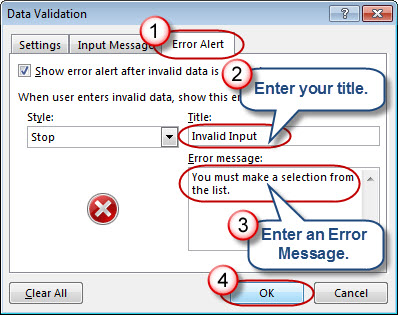 Figure 5: Be sure to complete the Error Alert tab; otherwise, invalid inputs will trigger a generic and cryptic error prompt. 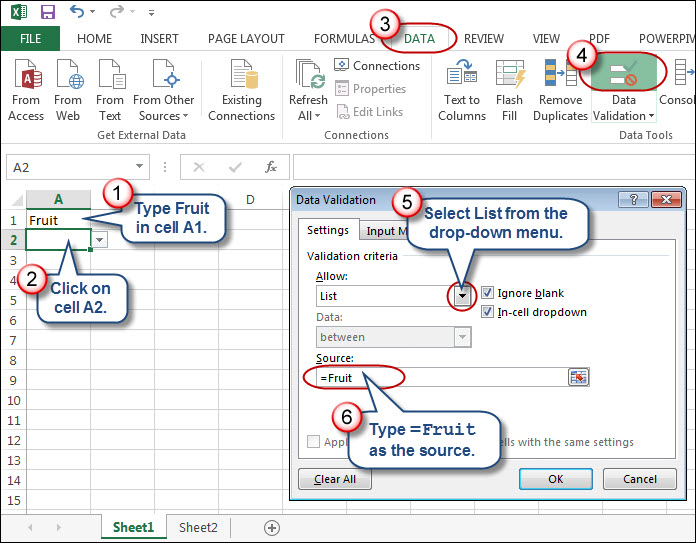 Going forward, when you click in cell A2, a note should appear as shown in Figure 6. This documents the spreadsheet. If the user makes a valid choice, he or she will then be able to move to another cell; otherwise, the prompt shown in Figure 7 will stop the user in his or her tracks. Figure 6: Our choices on the Input tab yield a helpful prompt when the user clicks on cell A2. Figure 7: The user will see this prompt if he or she tries to enter something that doesn't appear on the list. Now, return to your original list, and add two more items, as shown in Figure 8. When you return to your cell with the Data Validation list, the new items should appear automatically. The combination of the table/list features and range names automates this aspect. Within the Data Validation dialog box, you can provide a specific set of cell coordinates in the Source field, but you would then need to manually change the setting if you later expanded the list. Further, Excel 2007 and earlier won't allow you to reference cell coordinates on other worksheets. Best practices in spreadsheet design call for separating supporting lists from the actual data on separate worksheets. 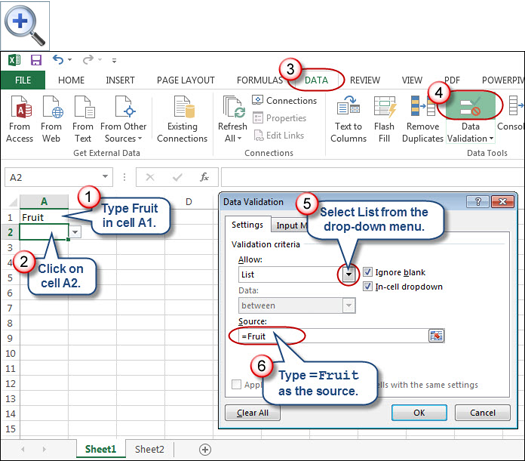 Anyone using Excel 2007 and later is no longer faced with the struggle of where to safely position supporting lists for Data Validation on the same worksheet as the actual input is occurring. Figure 8: Since the ultimate source for a validation list is a table/list, new items appear on the Data Validation list automatically.